While in Top Cut Butchery I spied some rather long kranksy and chorizo in a cabinet at the back of the shop so purchased one of each. When I was back in the shop a few days later, I brought some more. Being in Raglan, the wildlife like to enjoy the surf too. 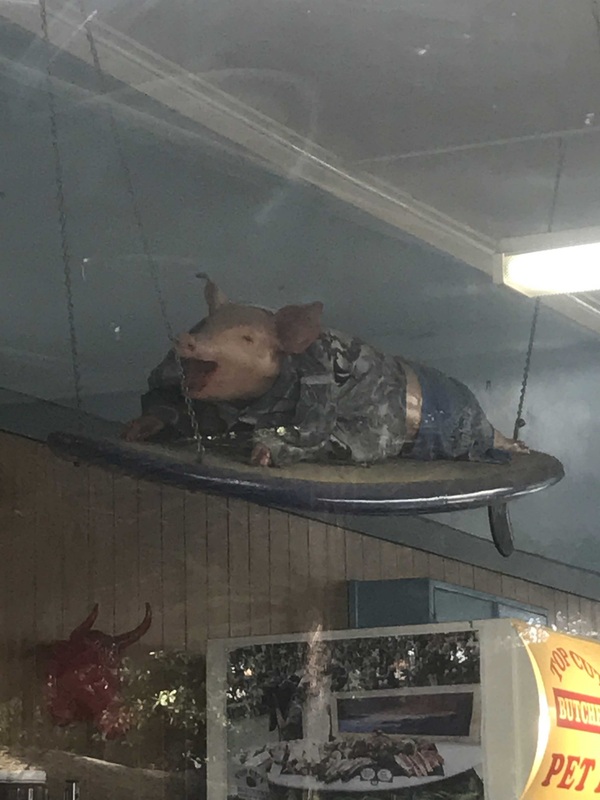 A pig rides a surf board in this butchery. The pig on the surf board. Both of these sausages are smoked. They do not have to be cooked, however I reheated them on the barbecue. The butchers in the shop had limited knowledge about these sausages. I asked if the seeds in the chorizo were mustard, but they did not know. They were able to say they thought manuka was used to smoke the snarlers and also told me that Friday was the day that the sausages were smoked. The word kransky is derived from the Slovenian words kranjska klobasa, which is the name for a pork sausage from Kranjska, a former province in the Austro-Hungarian Empire. It is made with pork, beef, bacon and garlic. This was a very good eating sausage, coarsely ground and with my favourite element on display, a large amount of smoke to add to the flavour. 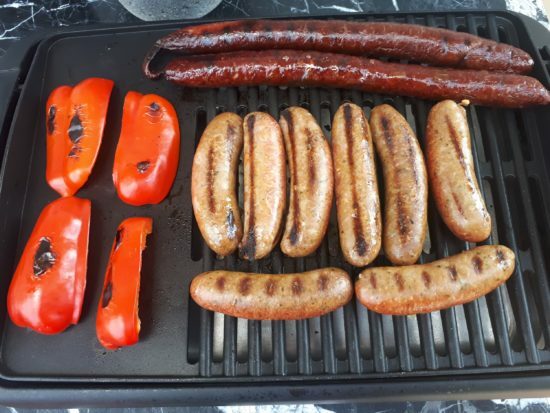 Chorizo and kransky on the barbecue. The chorizo is a coarse to medium grind with elements of paprika, chilli, mustard and smoke to add to the flavour. Whole mustard seeds are present in the mix. In the chorizo the smokiness is not as pronounced as it has to compete with the spices. This is an above average example of chorizo sausage. We brought some of these home to Wellington and the consensus from the whanau, was that the chorizo was the superior sausage. My view is that these are the best sausages that I have purchased from Top Cut Butchery. At five dollars a sausage I consider these to be good value. Just the thing to satisfy the appetite after a day in the surf. While in Raglan we stayed at a very nice compact studio, we have stayed here a number of times, if you are thinking of going to Raglan you could check this out here.